Our flowers have been bloomin' like KERAZY just for her! I miss you bunches Miss Dory.....you brought more joy to Blogville than any flowers ever could. Your smile was the light of Blogville. And, your heart touched us all. You have such pretty and unique flowers there, Ruby. We love them all. Watch out for that bee - don't let him bite you. Dory really was everyone's sweetheart. How beautiful. When Mom was a pilot she was based out in the desert in California, then with the airlines in Palm Springs and Santa Ana. She misses the beautiful flowers out there. Thanks for brightening our day. You have some very exotic and beautiful flowers, Ruby. I bet Dory is amazed and smiling! Ruby your flowers are beautiful and unique! 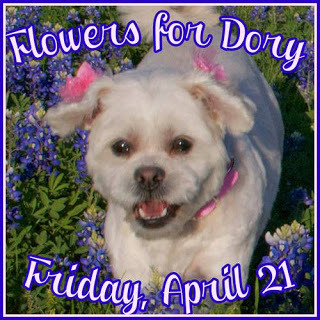 So many wonderful flowers for Dory today! What beautimous flowers Ruby...thank you so much for sharing them! What beautifur flowers fur Dory! We all miss her! Ruby, what fabulous flowers. They're all stunning! Dory would love them! We do. Ruby darlin' you have the eye of a florist and the heart of a really good and true Friend. I know Angel Dory and her peeps are smiling big Dory smiles today a the Dory pink flowers. Just lovely and as Charlie said...mom got a little chuckle out of the dang bee photobombing and I think Angel Dory would have told him he was not dress well enough to be in the photos. Everybuddy knows he either needed a hat or neckwear. Wonderful flowers and even the bee came to send love to Dory and her mom! You are right about two things - first the pink is totally Dory pink and second, Dory was the best and is greatly missed. So many beautiful flowers. Just perfect for our beloved Dory. You captured some pawmazing flowers Miss Ruby! I always hoped that Dory could be the maid of honor at our wedding! She would love your tribute Boo! I will bark my love at you tonight and together we will bark to DOry! What a beautiful tribute to Dory. Beautifully done, Ruby! What's with that bee photobombing, though?!? We will always think of our wonderful furiend, Dory, when we see pretty flowers.